I was born in Jersey in the Channel Islands too many decades ago to mention. I was a graphic designer for twenty years after gaining a Graphic Design Degree in Coventry. I then lived briefly in London before becoming a wife, mother and divorcee in Kent. After developing a chronic back condition in 2012, not wishing to claim benefits I took the bold, some might think foolhardy, action of selling my house in Kent and moving to the north of England in order to help fund my long-held ambition of becoming a full-time, published author. I now spend most of my days, including weekends writing, designing, publishing and marketing books. Since 2007, I have singlehandedly written, designed and published nine books on Amazon in kindle, paperback and several audiobooks. My first three books are mainly autobiographical and form the Mug Trilogy. Books in the Mug Trilogy are A Slice of the Seventies, The Lying Scotsman, and Straws. Potholes and Magic Carpets is a contemporary novel set in rural Kent and London. Random Bullets, my favourite book, is a paranormal thriller set in Jersey, Cornwall, Manchester, London and places not of this world. 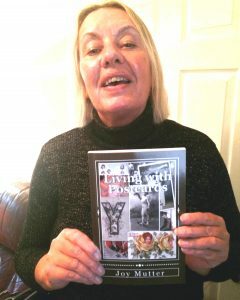 I have also published a non-fiction book, Living with Postcards. In 2016, I published a baker’s dozen of short stories in various genres, called Her demonic Angel and two paranormal thrillers called, The Hostile and its sequel, Holiday for The Hostile. In 2016, also made audiobook editions of The Hostile and Her demonic Angel. Audiobook versions of Random Bullets, Potholes and Magic Carpets and Holiday for The Hostile are in production. As I produce everything myself from start to finish, you can tell I’m a busy woman. I’d love to hear what you think of all of my books. Random Bullets was inspired by a chance remark made by my sister regarding inheritance. The Mug Trilogy consists of three autobiographical books. I decided to write the entire story of my life after first writing the second book of the series, The Lying Scotsman. I then wrote the first book of the series second, then wrote the third book, Straws in its rightful third place. Echoing my life, not even writing my autobiography was straightforward. Even as a professional graphic designer, I have always been an ideas person. I’m fairly easily inspired. The Hostile series was triggered solely after noticing a strange object in my home. My non-fiction book, called Living with Postcards sprung from my love of collecting postcards. I now own over two thousand of them and all the colour illustrations in my book are postcards in my own collection. Once I have a strong main idea, rough outline and a few characters, then I’m away. I’m usually as keen to know what’ll happen in my books as the reader. Ideas pop up on the hoof and the characters end up living in my head. The action plays out in my mind. This keeps the writing fresh. I always make three or four drafts of each book, a vital process to ensure each book is as I’d want to read it. I use Word to produce the work as I do not enjoy writing in longhand. It makes it so much easier to move chunks of text around and my handwriting has deteriorated over time. I keep several notebooks around the house to scribble down an idea and often use Notes on my iPhone whenever ideas come to me when I’m out and about. I usually work on my books from 11 to 6 every day, including weekends. I clearly see each character in my book as I write and briefly become that character and imagine the setting whilst I write about them. I’ve been known to change what I’d planned to happen to certain characters because I’ve become fond of them. If I dislike a character, they’d better watch out! Life is short, so if you want to write and you’re self-disciplined, self-reliant, resilient and talented, don’t just aspire, write. If you want others to read your work and it’s taking forever for an agent to represent you, publish it yourself once your book is as perfect as it can be. If you can’t stomach a feeling of despondency if your book is slow to sell, then don’t publish your work. A real author is one who continues to write even when nobody seems to care if you write another word. Writers sadly also have to be marketing experts, even if they’re traditionally published and not an indie author like me. Very little in life has given me as much pleasure as the writing process and publishing my books on Amazon. After sending my first four books to agents, although I received positive feedback, I became impatient and decided to self-publish. At my age, I could not wait around for agents to squeeze me onto their overcrowded lists. In July 2015, I published six of my books as Kindle editions using Kindle Direct Publishing. I then used Createspace to turn all six books into paperback versions in November 2015. As I worked as a professional graphic designer for twenty years, I also designed all my own book covers. I plan to self-publish all of my future books in this way as I’ve experienced no problems and enjoyed the process from initial book idea through to publication. My books are printed on demand through Amazon, so I don’t have to worry about storing thousands of books somewhere. I think that self-publishing will increase for both Kindle, paperback and audiobook formats. The reader will have to be vigilant to ensure they are not purchasing substandard work, although I don’t subscribe to the view that all self-published work is trash, as some people maintain. As an indie author who’s received encouraging reviews for most of my recently published books, I believe self-published authors have a strong, valid place within a crowded market. I’m immensely surprised, gratified and proud to have achieved my life-long ambition of becoming a self-published author of nine books in three formats.